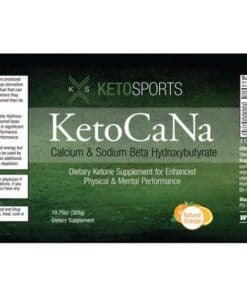 The latest product by KetoSports! KetoBlitz is a concentrate with a delicious limeade flavor. Mix 30mL of the concentrate with 300-400ml of ice cold water and consume for an immediate ketone boost. For some max peaks can occur as early as 15 minutes, providing energy and ketone benefits nearly on demand! Biologically, ketones have always been present in the human body during periods of starvation or carbohydrate depletion. The body begins ketone production as a preferred fuel source, maximizing production during these states. Today’s typical eating habits of overfeeding and carb dependence have stifled natural ketone production and prevented many people from realizing the numerous benefits of ketosis. However, the popularity of the ketogenic diet has exploded recently, and along with it have products that deliver ketones via supplementation. Such products are referred to as exogenous ketones, or ketones that are made outside of the body. Exogenous ketones allow people to elevate blood ketone levels without undergoing drastic dietary restrictions. As a result, exogenous ketones represent an increasingly convenient way to achieve the therapeutic benefits of ketosis. While many have realized the benefits of exogenous ketone supplementation, for some, the amount of minerals (i.e. sodium, potassium, calcium) usually contained in these supplements limits use. For this reason, we created KetoBlitz. KetoBlitz contains a new BHB source called BalanceBHB, a patent pending free acid and BHB salt blend, resulting in up to 50% less overall minerals per gram of bhb, more BHB per serving and a much better flavor than typical BHB products. KetoBlitz KetoSports is a concentrate with a delicious limeade flavor. Mix 30mL of the concentrate with 8-12 ounces of ice cold water and consume for an immediate ketone boost. For some max peaks can occur as early as 15 minutes, providing energy and ketone benefits nearly on demand! Consumption of KetoBlitz before exercise can result in significant decreases in oxygen demand and increases in performance. KetoBlitz may also heighten mental acuity and performance. KetoBlitz is excellent for ketogenic dieters who need energy but must limit carbohydrate intake. KetoBlitz may also be used by individuals who consume carbohydrates to provide an additional energy source and or limit exercise induced glycogen depletion. It may also be used to ease the transition into a ketogenic state. Brilliant product. Extremely fast acting- I only need half a portion to achieve the same ketone levels as a normal portion of bhb salts. Most efficacious exogenous ketone product I’ve tried. Elevates ketones very quickly and you can feel the energy. My first time trying exogenous ketone,got this product to help with my endurance training and it’s been brilliant,no more pre workout,the energy levels are so much better,this will now form part of my training.